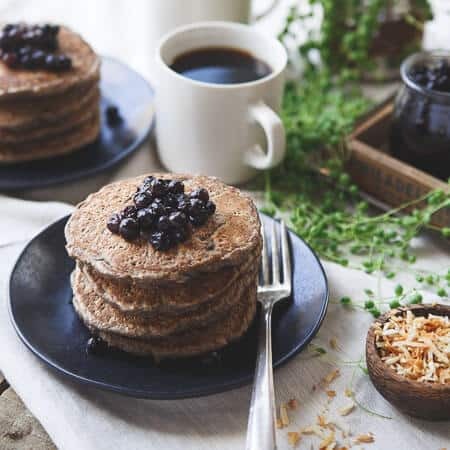 These cinnamon raisin oat bran pancakes have a combination of oat bran and buckwheat for a hearty texture with a touch of nutty toasted coconut. Top with your favorite fruit compote for a deliciously healthy start to your day. There’s this spot in the corner of our family room, right next to the sliding door that has the most magical light. It’s a cool, northern facing part of the house so even on a bright sunny day there’s never direct light. It’s diffused, faded and a photographers dream for pretty much the entire day. It also happens to be no where close to where I keep all my photography stuff. All the props, boards (see how I make photography boards in this how to make a photography board tutorial), random silverware, plates, bowls, light bounces, lenses, camera and tripod, couldn’t get farther away from this corner of the house if they tried. But this past weekend I decided to drag my beloved wood board made from recycled shipping palettes into that tiny corner of the family room, with my tripod leg butted up against the hearth of the fireplace and squeeze myself behind the camera (while literally almost having to sit on top of the wood burning stove as it pumped out 450 degree heat) to get a few shots in that magically lit space. These cinnamon raisin oat bran pancakes necessitated it. With their hearty, thick and rustic texture they just belonged in that spot. 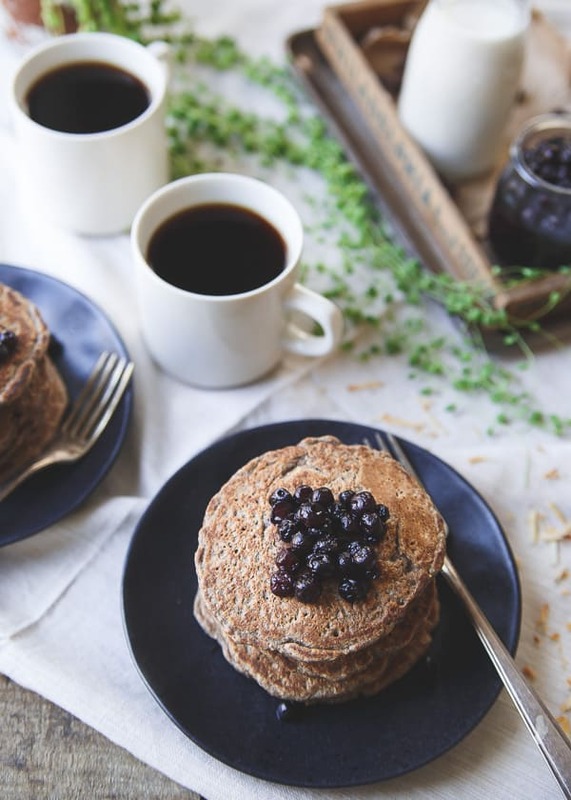 They’re a chill pancake, one that borders on hipster with its main ingredients being oat bran and buckwheat but still have a grasp on classical tradition with cinnamon and raisin. Kinda just like these pineapple buckwheat pancakes and these coconut flour pancakes. They’re the kind of pancake breakfast that doesn’t require a side of eggs for satiety, they’ve got it all. 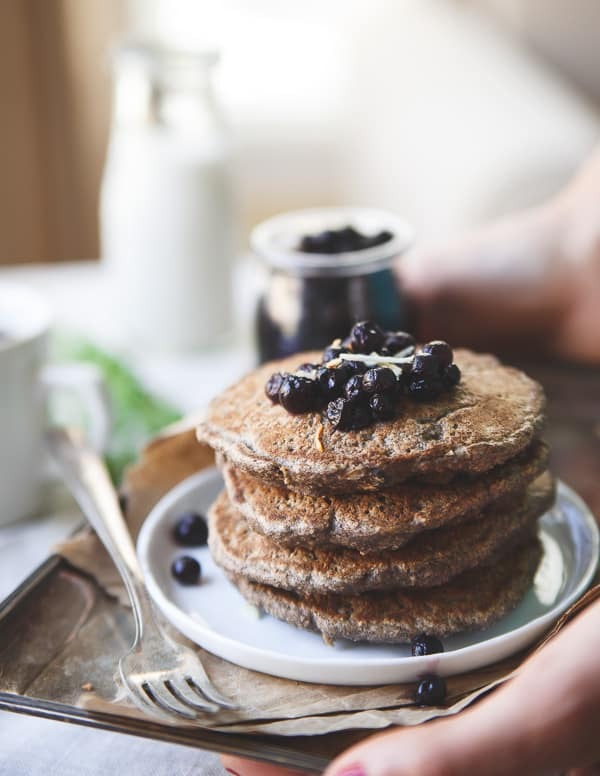 Just like these protein pancakes also made with buckwheat flour and a few secret ingredients that give them 30g of protein per serving! Also give their cousin – pumpkin protein pancakes a try. They’re dense but texturally interesting thanks to the toasted coconut and raisins, healthy but not so much so that you feel like you’re eating straight out of the bulk bins from the natural foods store. Ugh, didn’t you just imagine that nasty patchouli smell of a natural foods store when I said that? Gross. And when you top them with a simple fruit compote (I used a simple wild blueberry and maple syrup smash), they’ve got everything you want and need in breakfast in a short stack. I’ve been full blown obsessed with Bob’s Red Mill gluten free oat bran (they have gluten free versions of SO many oat products now, it’s awesome) lately (hi, I’m apparently 85). My usual and so very predictable way to enjoy it is just in typical hot cereal fashion heated up with a combination of milk and water, some nut butter swirled in and a few berries on top. I’m not really sure anything can beat these pancakes though when it comes to preparing oat bran. Ok, this simple post workout chocolate protein oat bran bowl is pretty delicious too. If you’re not into the hot cereal sludge texture thing (as a kid I was SO grossed out by it so I get it), these are the perfect (gluten free!) way to enjoy the health benefits of oat bran. Just find a cool corner of your house, don your hand-knit sweater and channel some of those inner hipster vibes before taking a bite. Looking for more gluten free pancake recipes? Check out these banana nutmeg pancakes, these orange basil ricotta pancakes or these meyer lemon quinoa pancakes. 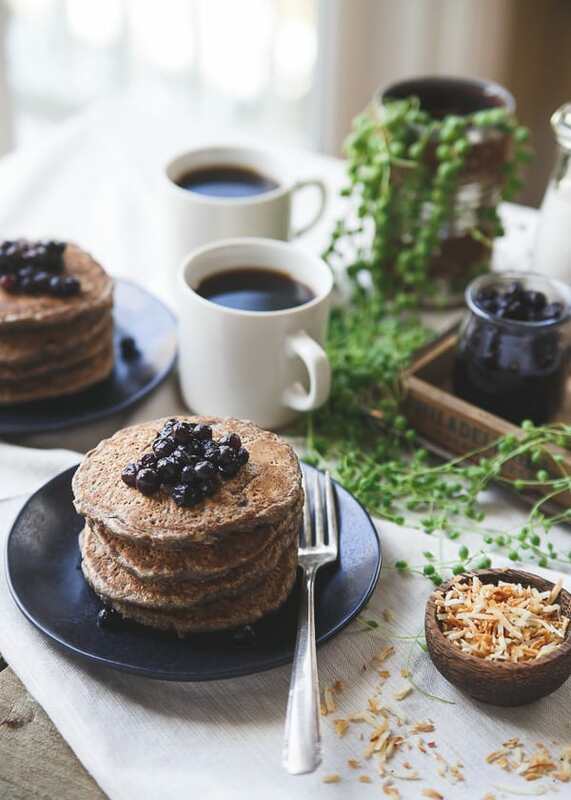 These cinnamon raisin oat bran pancakes have a combination of oat bran and buckwheat for a hearty texture with a touch of nutty toasted coconut. Combine the oat bran, buckwheat flour, baking powder, cinnamon and salt in a large bowl. Add the egg, maple syrup, vanilla bean paste and coconut milk to the bowl and stir until well combined. Gently stir in the raisins and toasted coconut. Grease a griddle over medium heat with butter or coconut oil. Once hot, pour batter onto pan and cook for 2-3 minutes until browned and set. Flip pancake and cook an additional minute on the other side. Repeat until batter is finished keeping cooked pancakes warm on a plate in the oven on the lowest temperature setting you can. Serve warm and top with your favorite fruit compote or jam. Top with your favorite fruit compote. I smashed some wild blueberries and maple syrup together for these. *This post is sponsored by Running to the Kitchen partner, Bob’s Red Mill. All content and opinions are my own. These look absolutely amazing and well worth moving photography equipment. YUM! Gina, all your pictures are stunning. I am totally envious of your naturally difused spot–but this shot of the pancakes is pretty fabulous! I came across your photo on Foto Food Gallery and wanted to comment because you really nailed this! Great composition, directional light and it tells a story. Beautiful! Pancakes are my addiction. I could totally eat them for EVERY single meal! I love how wholesome and flavor packed these babies are…I need a stack! Pinned! These are my kind of pancakes! I love how hearty they are and I love all BRM products! These pancakes are AMAZING! And wild blueberries? Absolutely brilliant idea! It’s been on my to-do list forever to try Bob’s GF oat bran. I’m glad you approve! I’m lucky I have a 12 foot sliding door in front of my kitchen with amazing light and a small cupboard next to it with all my photography goodies. It’s convenient and I don’t think I could ever leave! These look amazing!!! Cinnamon raisin bread, bagels, cookies…now pancakes! Always the best! These photos were well worth the struggles because they are gorgeous! I can picture myself sitting and eating a plate of these wholesome pancakes on a cold morning. 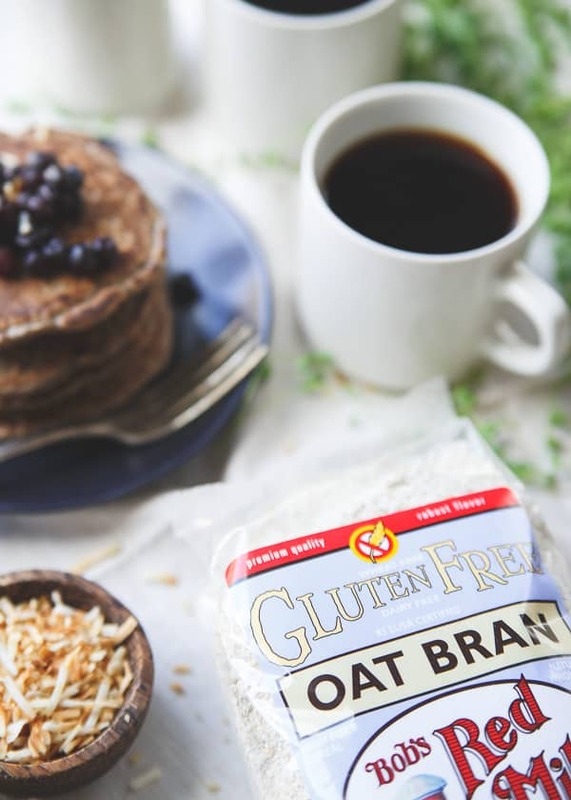 I love that you used Bob’s Red Mill Gluten Free Oat Bran! These pancakes are totally hip and in style, they’ve got it all! Almost like the classic black dress that doesn’t need any accessory! So growing up my mom only ever made buckwheat pancakes and now as an adult they’re my absolute favorite. I love that you added oat bran too! I would just love to sit in that little corner of beautiful light with a stack of these pancakes! I’ll be dreaming of them until morning – I love how hearty they are, what a great start to the day! I’m not usually even a pancake fan but I love the idea of these! And your setup is so inviting!! LOVE the lighting in these photos, Gina! I’ll take a few stacks of these, please! 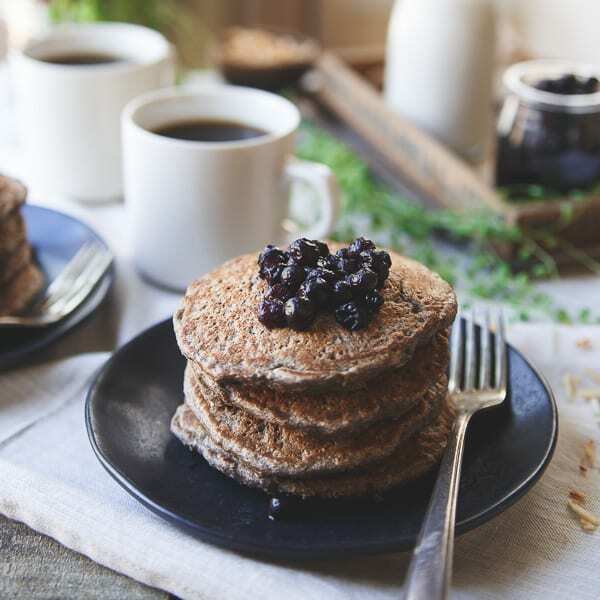 Buckwheat and oats in pancakes with blueberries. Love these! And your photos are beautiful! I’m not a huge hot breakfast cereal fan so yes, I can totally get behind these pancakes!! My family would eat pancakes 3 times a day and these look beyond delicious! It’s been a while since I’ve had pancakes, and I think I just found my new recipe :) I LOVE hearty textures from buckwheat and oat bran. Adds a lot of nuttiness too! Looks delicious! How much coconut milk are we supposed to use? It says 1 14 cup.